Hello, thanks for previous help. I have successfully received a brand new replacement I have only one more question: is my warranty is extended by extra 3 years or not? no warranty still applies from the original date of purchase. I had similar problem. I have received several notifications from Windows and motherboard's UEFI that my disk in need to be replaced. 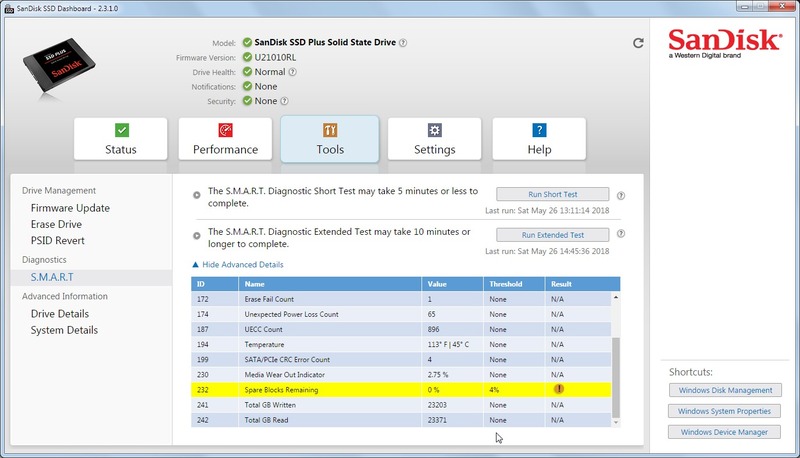 SSD Dashboard shows exclamation mark in "Spare Blocks Remaining" but shows "Drive Health: Normal". So... this SSD is good or bad? If is good why BIOS and windows notify me? If is bad why San Disk Dashboard "Drive Health: Normal" ? Should I generate RMA and send it back to San Disk?